President Donald Trump’s former chief strategist slammed Nikki Haley’s decision to announce her resignation as U.S. ambassador to the UN on Tuesday as “suspect” and “horrific,” saying it overshadowed positive news the president needs to help rally support ahead of next month’s midterm elections. Bannon said Haley’s announcement, which took top White House officials by surprise, diverted attention from Brett Kavanaugh’s first day as a justice on the Supreme Court and last week’s news about the lowest U.S. unemployment rate in five decades. Her move undermines President Trump’s message to voters at a time when the Republican majority in the House of Representatives is at stake, Bannon said. In the Oval Office on Tuesday, Trump said Haley told him six months ago she wanted a break after spending two years in the post. She’ll continue in her role until year’s end. 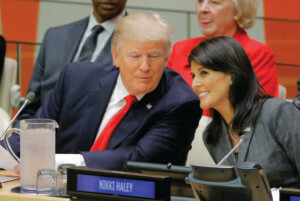 Haley said Tuesday that she was ready for a break after two terms as South Carolina’s governor and two years at the United Nations. The president on Wednesday defended the timing of the announcement. Trump said “there’s no good time” for Haley to have announced her resignation, and that if she had waited until after the midterms there would have been speculation that the election results influenced her decision. Trump also said again on Wednesday that he’s considering Goldman Sachs Group Inc. partner Dina Powell to replace Haley. Powell is a former White House adviser to Trump who left the administration in January. “We are certainly looking at Dina,” Trump said, but added that there are other candidates he didn’t name, including people currently within the administration. “Many people want that job,” he said. Bannon, who left the White House in August 2017, said he took Haley at her word that she won’t run for political office – possibly against Trump – in 2020. Haley said she looked forward to campaigning on Trump’s behalf in two years.